Myanmar's leader Aung San Suu Kyi talks during an interview at her residence in Yangon in this May 25, 1996 file photo. NOBEL Peace Prize winner Aung San Suu Kyi is set to lose the freedom of Edinburgh over her failure to condemn the persecution of Rohingya Muslims by her country’s army. The 73-year-old leader of Myanmar – formerly Burma – was given the Capital’s highest honour in 2005 when she was still in opposition and under house arrest. She was hailed at the time as a beacon of democracy. But now Lord Provost Frank Ross is leading the bid to remove the title. After elections in 2015 Aung San Suu Kyi became State Counsellor in Myanmar – the equivalent of prime minister – and announced a commission on Rakhine state, where there was a long record of persecuting the Rohingya. However the persecution by government forces escalated and around 700,000 Rohingya people have fled to neighbouring Bangladesh. Aung San Suu Kyi does not control the military but she has refused to speak out against the violence despite appeals from around the world. The Lord Provost wrote to her on behalf of the council in November, condemning the violence in Rakhine and calling on her to use her “immeasurable moral courage and influence” to allow the United Nations to intervene to ensure the safe return of the Rohingya people. There was no response to the letter and Cllr Ross has tabled a motion for Thursday’s full council meeting saying the freedom of the city should be removed from Aung San Suu Kyi with immediate effect. It is only the second time in 200 years that anyone has been stripped of the title. 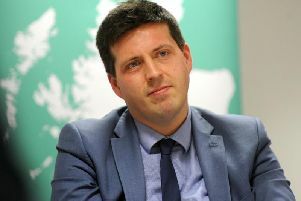 Cllr Ross’s motion notes “the ongoing humanitarian crisis in Northern Rakhine and in the refugee camps of neighbouring Bangladesh”, expresses “disappointment” that there has been no communication from Aung San Suu Kyi and says the freedom of the city award should therefore be removed. The first time the freedom of the city was awarded was in 1808. The Queen, Prince Philip, Sir Sean Connery, Nelson Mandela, Sir Chris Hoy and Professor Peter Higgs are among those to have received the honour. A magnolia tree was planted in Aung San Suu Kyi’s name in Princes Street Gardens in 2005 but the council said there was no call to remove it. And a portrait of her was commissioned from artist David Mach for the city’s permanent art collection in 2006. A collage made from thousands of picture post cards of Burmese political prisoners, it hung in the council’s main offices at Waverley Court as part of the rotation of artworks. But the council said it was now in storage.